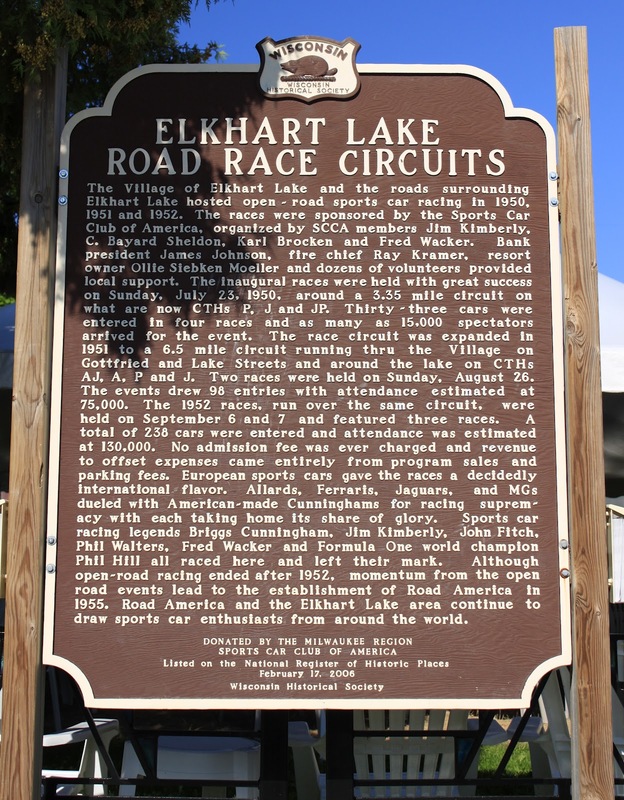 The Village of Elkhart Lake and the roads surrounding Elkhart Lake hosted open-road sports car racing in 1950, 1951 and 1952. The races were sponsored by the Sports Car Club of America, organized by SCCA members Jim Kimberly, C. Bayard Sheldon, Karl Brocken and Fred Wacker. Bank president James Johnson, fire chief Ray Kramer, resort owner Ollie Siebken Moeller and dozens of volunteers provided local support. The inaugral races were held with great success on Sunday, July 23, 1950, around a 3.35 mile circuit on what are now CTHs P, J and JP. Thirty-three cars were entered in four races and as many as 15,000 spectators arrived for the event. The race circuit was expanded in 1951 to a 6.5 mile circuit running thru the Village on Gottfried and Lake Streets and around the lake on CTHs AJ, A, P and J. Two races were held on Sunday, August 26. The events drew 98 entries with attendance estimated at 75,000. The 1952 races, run over the same circuit, were held on September 6 and 7 and featured three races. A total of 238 cars were entered and attendance was estimated at 130,000. No admission fee was ever charged and revenue to offset expenses came entirely from program sales and parking fees. European sports cars gave the races a decidely international flavor. Allards, Ferraris, Jaguars, and MGs dueled with American-made Cunninghams for racing supremacy with each taking home its share of glory. Sports car racing legends Briggs Cunningham, Jim Kimberly, John Fitch, Phil Walters, Fred Wacker and Formula One world champion Phil Hill all raced here and left their mark. Although open-road racing ended after 1952, momentum from the open road events lead to the establishment of Road America in 1955. Road America and Elkhart Lake area continue to draw sports car enthusiasts from around the world. The marker is located on southbound South Lake Street, at its T-intersection with Square Street, at the entrance to Lake Street Café Beer Garden, at or near 21 South Lake Street, Elkhart Lake, Wisconsin 53020. 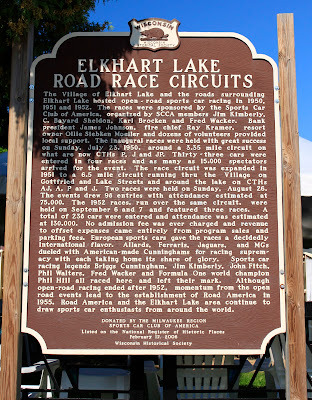 See also, Sheboygan County: Historic Race Circuits of Elkhart Lake, for a series of markers that follow the race circuit throughout Elkhart Lake. Click here for a map of all marker locations. The marker is located in Elkhart Lake, Wisconsin.